Neuropathic pain is the most common and disabling symptom in small fiber neuropathy (SFN). It usually presents as a burning or tingling sensation in the distal limbs, accompanied by increased pain sensitivity, such as hyperalgesia or allodynia. Neuropathic pain in SFN may be a direct consequence of enhanced sensitivity in small myelinated Aδ and unmyelinated C fibers due to axonal degeneration or local inflammation. Damage to these nerve fibers facilitates the release of nerve growth factor or proinflammatory cytokines, which in turn activate nociceptive receptors expressed in sensory neurons, including voltage-gated sodium channels, transient receptor potential cation channel vanilloid type 1 (TRPV1) receptor, and glutamate receptors. 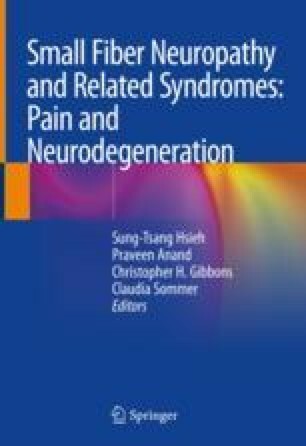 Neuropathic pain may also be attributed to maladaptive plasticity in the central nervous system, where hypersensitivity in the spinal or cerebral nociceptive systems, also known as central sensitization, is induced by long-term peripheral overstimulations. In addition, sensory deafferentation due to peripheral denervation also contributes to the development of chronic central pain, where cortical reorganization or remodeling in the pain-processing areas sustains augmented nociceptive responses. Treatment of neuropathic pain in SFN is challenging. Pharmacological therapy is the major strategy to alleviate neuropathic pain in SFN. Possible choices of medications include antiepileptic drugs, antidepressants, and opioids. However, up to 40% of patients with neuropathic pain are refractory to pharmacological treatments. Nonpharmacological therapeutic strategies, e.g., stimulation of peripheral sensory nerves, the spinal cord, or the brain, may be considered as an alternative for patients who are nonresponsive or intolerable to medications. In recent years, noninvasive brain stimulation techniques including transcranial magnetic stimulation (TMS) and transcranial direct current stimulation (tDCS) have shown promising advances in pain treatment. These techniques may reset nociceptive processes in the brain by modulating synaptic plasticity in the pain-processing areas. Nevertheless, large randomized clinical trials are still warranted to evaluate the efficacy of these alternative treatment methods.